From inside to outside. That’s the fundamental design philosophy behind Series 7. First develop an optimal, cost-no-object technical solution for perfect audio. Then design a sleek, understated cabinet to house it. The result is purity of sound. Without adulteration or artificial enhancement. Nothing added, nothing left out. True high fidelity. The cutting edge technology behind all our high quality components ensures measurable performance second to none. The sound is better still, perfect we believe. Peerless. That’s why listening with soulution is a sensual experience. One which conveys unique emotions. Our equipment is merely the medium. Simply: the nature of sound. The Series 7 amplifiers – the 701 mono amplifier and the 711 stereo amplifier – both feature a modern, newly designed switched mode power supply possessing significant sonic advantages over older linear designs. With perfectly regulated output voltages and massive current ratings, these new designs are ideally suited to audio amplifier applications. 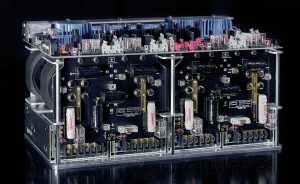 The use of substantial copper connectors and rails ensures that large amounts of current can flow unhindered whenever the amplifier demands them. The modern design of the Series 7 components was honoured by with the international “red dot award”.